Metrics are a funny thing in SaaS. You look at metrics like your MRR and customer acquisition and feel like you're on top of the world. But then you glance over at feature adoption and churn for the same month and all of a sudden the company seems doomed. That's because numbers like MRR tell you about past performance—how much money you were able to make over the past month. But churn is a metric that gives you insight into future performance—how sticky your product is and whether your growth is sustainable. We're here to tell the optimists among you that churn isn't a problem you can turn a blind eye to—it will sink your business if you don't do something about it. And we're also here to tell the pessimists among you that churn is a problem than can be addressed, ASAP. Here are some stats that will help you put that churn number in perspective. A 5% improvement in retention results in a 25-95% profit increase. When you put tons of time and resources into improving that retention number, it's easy to get discouraged when you see it bump up just a few percentage points. But just as churn compounds, so does customer retention. A five percent increase in your retention number snowballs and keeps more and more revenue from escaping that hole in the leaky bucket. Most product managers attempt to try several retention strategies all at once. But Kissmetrics founder Hiten Shah recommends that people do the polar opposite. He says that the best way to quickly improve retention is to focus and prioritize. Use analytics to pinpoint which features are the least sticky, and then work with your whole team to address them. Here are the benchmarks you should aim for, in order of importance. Core features should be the stickiest. If your core features aren't getting the highest retention numbers, then you're treading in dangerous waters. You'll lose track of who you're building for and your product won't have a clear value. Refocus your outreach to drive users to the most important features of your app. Customers should be using >3 features on your platform. Even though customers should be spending the most time in your core features, it's important that they take advantage of the whole platform. The more use cases your platform can address for a particular customer, the stickier your app. Features that don't correlate with retention should be deprecated. If you have features that few customers use, they're distracting from the central value of your product. Deprecate them so that your dev team can focus on the features that matter. A 3% monthly churn is actually 31% annually. There are few sources brave and credible enough to give you solid retention benchmarks. Redpoint VC Tom Tunguz is one of them. He points out that few businesses know what retention number they should be aiming for—and if they do know, it's usually wildly inaccurate. A great customer retention is 3% annually, not monthly. If you have a 3% monthly churn, compounded it amounts to about 31% annually. Acquiring customers is expensive—especially in the early days—and unless you have a great customer retention number, you're just throwing away those dollars on soon-to-churn customers. Dev resources. Your dev is the lifeblood of your company. If your team is barely able to handle product updates and bug fixes, how can they build new features that fit existing customers' needs? Make sure you have enough developers to fix your current product while expanding and iterating. An analytics platform. Management expert and advisor Peter Drucker says you should outsource anything that isn't your core product. Your dev team can likely throw together a basic analytics platform, but it's better to just outsource to the experts. Use an easy-to-integrate product like Amplitude to get laser focused insights. Onboarding tools. User onboarding is the most important part of a user's journey. So if you get it right, you can lift your entire retention curve and see drastic revenue increase—25% for each percentage that you improve retention. 30% of customers change brand just for variety's sake. Software companies used to sell software licenses. That meant you only had to win over each customer once to stay profitable. But with SaaS, you have to win over your customers month after month to just keep your head above water. In the highly-competitive B2B space, that means you have to constantly improve to not get squeezed out of the market by a new and better product. Every time you build a new feature, you're increasing the value of your product. And the more valuable your product is, the more reasons your users have to stick around. But you'll never see that return on that investment if your users don't adopt your new features. Months of hard work and planning will go to waste. alert inactive users through email, potentially nudging them back into the app. Not only do they take advantage of both channels of communication with their customers, but Trello stays consistent. 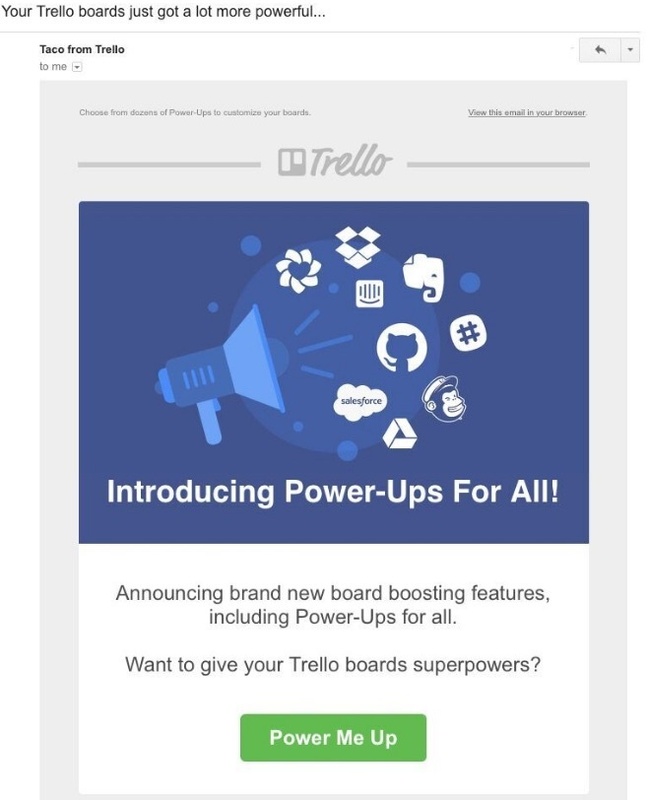 The tagline, “Introducing Power-Ups For All!” would remind a user who saw the email of the feature once they actually logged in. Stay consistent in your messaging and make email an extension of your in-app tone. 86% of customers trust companies less than they did five years ago. Analytics tools have increased the amount of data available to product people and marketers have enabled us to gain an excellent understanding of our user base and our target demographic. The flip side is that customers feel like their privacy has been compromised and that businesses are exploiting the amount of information that is available on the internet. That means that they're skeptical about the intentions of any company and long-lasting business-consumer relationships are near impossible to achieve. When you grow to have 100 million users, you can't have a personal relationship with each of them. But according to Paul Graham, it's important to do things that don't scale while your company is still small. Having a close relationship with some of your most enthusiastic users will get you valuable, honest feedback on your product, and help you build a trust-based community through the referrals that they might bring in. Here's the best way to build relationships with your customers. Check in personally and regularly. A customer success person is great and all, but users always want to hear from a person that calls the shots. Whether you're a founder or a product manager, never distance yourself from the customers you're seeking to make happy. Invite them to lunch. Everybody loves free lunch. This gives you the opportunity to connect on a personal level and get to know customers as people, and vice versa. Throw events for staff and customers. Studies have shown that a thank you or an act of appreciation is better for your customer relationship than any kind of discounts. Throw a party or event for your customers and your staff to show them how much they mean to your business. Customers are 2.5x more likely to warn friends about a bad experience than a good one. Humans have a better memory for negative experiences than positive ones. That's why they're more likely to warn their friends about a bad company than recommend a company they love. And while you might think that you're safe from a bad rap because you haven't been getting many complaints, think again. Users are quicker to unsubscribe and switch products than to contact a customer support team member. It's important to solicit feedback regularly to catch small issues before they snowball and get out of hand. The faster you locate and address these problems, the less customers will be affected. Don't ask new users. Make sure you're asking feedback from customers that have been around for a while. Surveying new users will confuse them and give you a warped idea of your problem areas. Nail the timing. 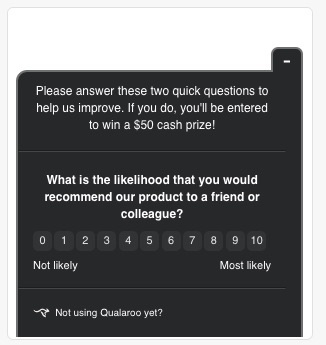 Tie your survey to in-app behaviors that indicate that the user has the time and attention to complete your survey. Make the experience seamless. Minimize the time commitment required and keep them on the same page (don't redirect). While these stats are hair-raising, improving customer retention means more than just the ability to keep your head above water. In fact, 80% of your future revenue will come from 20% of your user base today. Convince just a few more users into sticking around more, and that future revenue number goes way up. So now that you're convinced of the importance of customer retention, here's a retention calculator to make your life a little easier.